The remote control lets you control the projector from almost anywhere in the room, up to 23 feet (7 m) away. You can point it at the front or back of the projector. 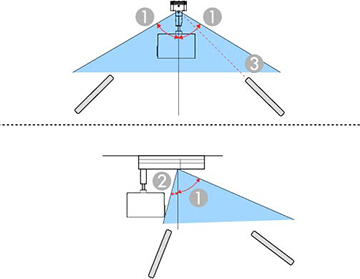 Make sure that you aim the remote control at the projector's receiver within the angles listed here. Note: Avoid using the remote control in conditions with bright fluorescent lights or in direct sunlight, or the projector may not respond to commands. If you will not use the remote control for a long time, remove the batteries.